Jackie Gayle Miller, 61 of Paint Lick, passed away peacefully Thursday, April 4, 2019 at the Markey Cancer Center. Mr. Miller was born in Madison County on December 17, 1957, the son of Blanche Rison Miller and the late Floyd Miller. He grew up in Pryse, KY and was employed by CSX Railroad for 17 years. He later went on to work in excavation for another 17 years. He was an avid Nascar and John Deere fan. His children and grandchildren were the joys of his life. He is survived by his wife of 41 years, Alesia Dennis Miller; his mother, Blanche Miller of Irvine; two sons Chad Miller (Jennifer) of Richmond; Nick Miller (Bobbi Jo) of Berea, and one daughter; Amy Rapier (Ralph), of Paint Lick, two brothers; Earl Miller (Carolyn) of Lancaster and Tony Miller (Lisa) of Irvine; one sister, Lou Ann Hall (Darrell) of Irvine; mother and father in law, Ruby and Earl Dennis of Richmond; nine grandchildren; Wesley Marcum, Wyatt Marcum, Walker Marcum, Austin Miller, Elizabeth Miller, Landon Miller, Zachary Miller, Warren Rapier, and Peyton Miller; as well as several nieces and nephews. In addition to his father, he was preceded in death by his grandson, Jacob Wilder Rapier. Funeral services will be conducted at 11:00 AM Tuesday, April 9, 2019 at the Combs, Parsons & Collins Funeral Home with Dr. Jerry Huffman and Bro. Clarence Rison officiating. 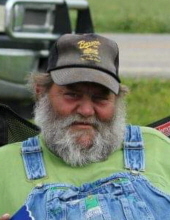 Burial will follow in Manse Cemetery in Paint Lick, KY.
Visitation will be 4-8PM Monday, April 8, 2019 at the funeral home. Pallbearers will be Greg Kirby, Josh Miller, Chris Miller, Dustin Miller, Wesley Marcum, and Dennis Lakes. Honorary pallbearers will be his grandchildren. "Email Address" would like to share the life celebration of Jackie Gayle Miller. Click on the "link" to go to share a favorite memory or leave a condolence message for the family.